When I start my PC, it boots into Windows (Windows 7 32-bit) quite happily, I login and the main Windows screen appears. At that point, however, the system is extremely unresponsive for up to 5 minutes - if I click on Firefox to start it, nothing appears to happen for a long time, etc, etc. The mouse and Windows UI is responsive, but programs take forever to start, webpages seem to hang (or at least load extremely slowly) and so on. I imagine that the issue is with one or more programs that run on startup, but I don't know quite how to identify which one it might be. The event log shows nothing of any obvious interest. I can't see any high CPU activity in task manager or Process Explorer, and I can't hear any high disk activity. Something that gave me an overall "what are the current key bottlenecks in this system" summary (ideally, which could be set to run in the background and collect data for later analysis). Some means of starting a program (say, Firefox) and have it record what was going on in terms of waits and delays in the system. Unfortunately, I've never really found anything like either of these. Download the setup from Windows Performance Analysis Tools for your Windows version. Press ENTER once to start the command, now you will have to wait till your the action is done. Right after your action is done you go to the console and press ENTER. After waiting some time a log file myTrace.etl will be produced. Compress this to a zip file, put it online somewhere (perhaps 2shared). Share the link here, I will do an attempt to find and show you the cause of your problem. For an user-friendly and simple approach, check @harrymc suggesting Soluto. For detailed boot analysis, check this document, XBootMgr.exe is available in the WPT I linked earlier. UPDATE: Soluto has moved on and its software relates now to the mobile world. Soluto’s original “Anti-Frustration Software” is no longer available from the manufacturer; one would need to look on the Internet for an old version of it, which might not still work after all. A pity, since it was a rather unique product. Here is an archived copy of their website. Their URL now redirects to asurion.com, which appears to offer technical services, but no products. 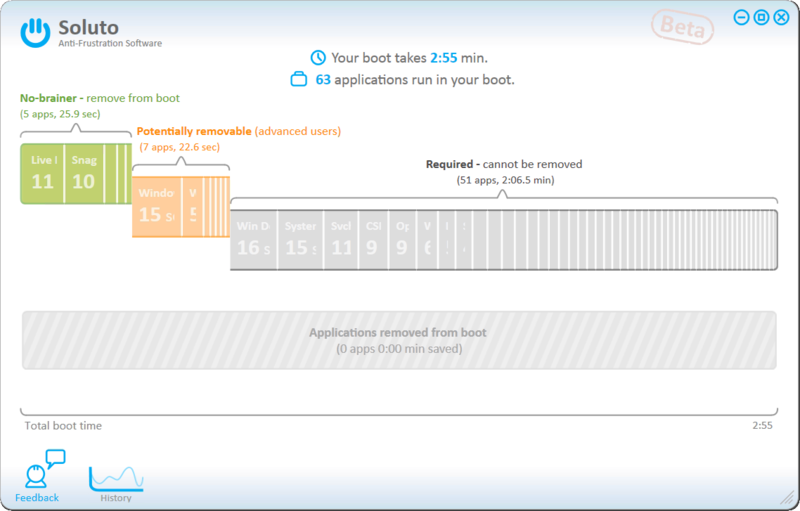 Soluto is an excellent boot-analysis product. For more info see: Soluto Figures Out What’s Bogging Down Your PC (And Tells You How To Fix It). 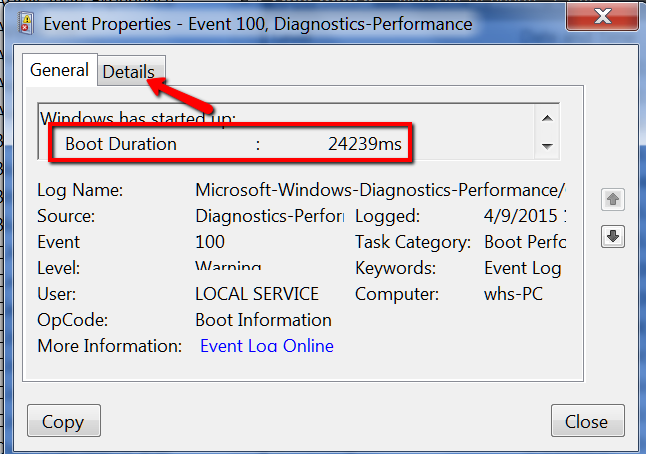 Then double click on Event 100 which gives you this small window indicating the boot time. Then click on the 'Details' tab which gives you all this additional information from which you should be able to determine the process which takes the most time during boot. Not the answer you're looking for? Browse other questions tagged windows-7 windows boot performance or ask your own question. How can I analyze performance issues before/during the logon process? Why is my Windows unbearably slow? How to discover what is slowing down my computer's startup? How to speed up the booting process in Windows 7? windows 7 becomes unberable slow, what could I do? How to profile long session initialization during boot process in Windows 8? Does installing many programs really slow down Windows? How to diagnose reason of blocking in fltmgr.sys (HDD access slow) in Windows 7? How to diagnose slow (only for awhile after start) Windows 7 machine?